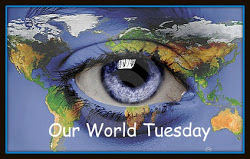 It's time once again for Our World Tuesday, a weekly meme that encourages bloggers to share images of their world. It's a great way to get a glimpse of life through the eyes of others! You can find out more about it here. Even if you don't participate, I encourage you to take a look at the intriguing photos that bloggers from around the world share each week. I chose today's photo not because it's particularly beautiful but because I like the composition. 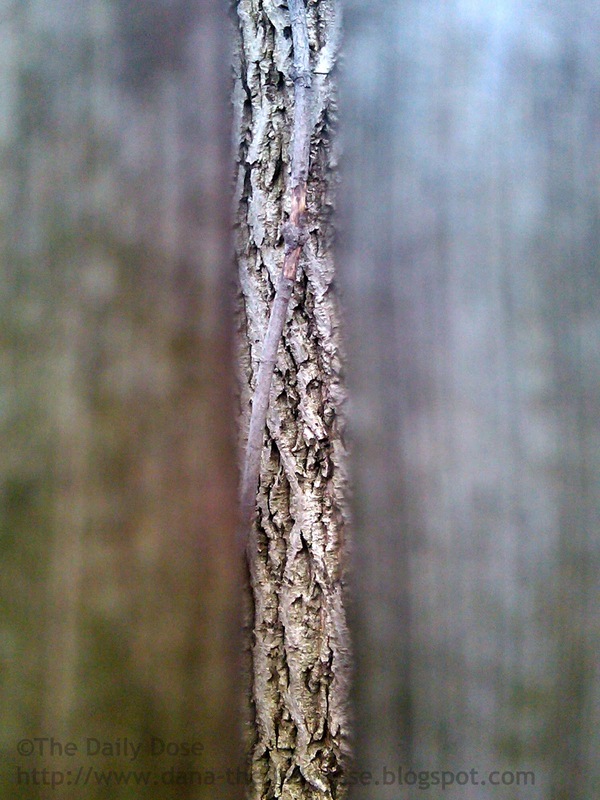 It's the trunk of a tree as seen through the slats in my neighbor's fence. I like the perspective—the way either the tree or the fence stands out to the eye, depending on which one you choose to focus on. 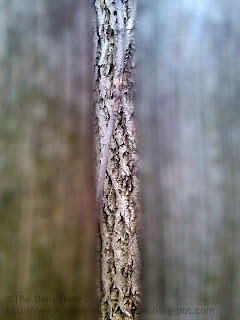 It's a tree as seen through the slats of a fence. I also like the composition of this photo. It's a great, creative image. What an awesome and unique perspective Dana. I love this. Yes Dana...it is so interesting. I love the texture of the bark! It's all a matter of perspective. This IS a lovely shot! Nice! I like the perspective! I love that perspective--very cool! truely beautiful pic! An amazing Tuesday to you, too! Great shot!! Boom & Gary of the Vermilon River, Canada. I was drawn to the tree, but since you mentioned the slats, I took the time to focus on those. Very nice picture! I like this, Dana; good observation to see it and photograph it! That is a very interesting photo. I've never thought of doing that before, yet by taking a photo that way you can see more of the bark design, rather than be taken in by the whole tree. Very true. It's amazing how much of an object we miss until we slow down and really focus on the details. Wonderful! I like this composition! Gorgeous! Very cool! I'm also a big fan of different composition and funky framing. Very unique photo :) I love it! I hope you post them! I just discovered your blog via Rebecca's blog. I love your header so much!! :) And I love that you posted a picture of a tree, which is totally what I saw first. When I was a kid, a huge maple tree stood outside my window and threw the most gorgeous shadows over my walls. My other favorite tree was a Chestnut tree that had perfect climbing branches. I moved into my new place fairly recently (in a new city) and the people who lived here before, apparently, were tree-phobic. It's sweet to plant some new, scrawny trees though. It's sweet to see them bloom this spring. What do you write? About trees: they're my favorite thing to photograph, especially in the winter when the branches are bare. I love your tree stories. When I was a kid, a pine tree stood outside my bedroom window. It was a great tree; I used to lie on my bed and look out at and dream... :) Good luck with your new trees. Yes, they're beautiful when they bloom. I write poetry, mainly. Are you a writer, too? I write middle grade fiction. I sometimes write other things as well, but mg is currently making my heart happiest. What a cool picture. You are so imaginative! That made a great picture. As you say it depends what you focus on as to what you see. The same with life. Wow, great idea for a photo! Impressed with you lady! Very unique and distinctive. I like it. Thanks for the photo! Have a great Tuesday! Thanks. It was a fun shot to take. Great shallow depth of field! Keeping my finger crossed for spring! Oh it is a gorgeous one indeed, and very intriguing to see! Life as a mother is certainly not uneventful! I began this blog to record the good moments--as well as the not so good ones--and to chronicle my struggle to balance motherhood with my lifelong dream, writing. Hope you enjoy! A not-so-thirty-something frazzled mom, wife, writer, and voracious reader living the creative life! Picture Window theme. Theme images by Cimmerian. Powered by Blogger.